Dr. Douglas E. Mazzuca was the first surgeon to perform small incision cataract surgery in the Salem County area. This technique was and is a breakthrough in the treatment of cataracts, because the procedure is performed through a very small (3mm) corneal incision. There are no blood vessels to cut and, hence, there is no bleeding. Patients who are on anti-coagulants (coumadin/warfarin), aspirin or other “blood thinners” are free to continue these medications. Since the incision is so small, they heal more quickly and induce little if any astigmatism that you would expect in a larger incision. This small incision also revolutionized a whole new line of lens implants that can “fit” through the incision. All of our lens implants fold “like a taco” through the incision and open in the eye to its natural state. Cataract surgery takes about 10 minutes to perform in Dr. Mazzuca’s hands and is performed under topical (eye drops) anesthesia. No needles are used for this procedure. The patient is in the surgical facility for about 2 hours before being discharged. Patients are sent home without a patch and asked to take eye drops for several weeks. They see their doctor the day after surgery. The trend in ophthalmology has been finding, smaller, less invasive ways to operate, while maintaining the highest possible standards of surgical care. This state of the art procedure does just that, because there is such a small incision and it requires only topical anesthesia. Artificial lenses (IOLs) are implanted in the eye to replace natural lenses that have been damaged by cloudy cataracts or presbyopia. 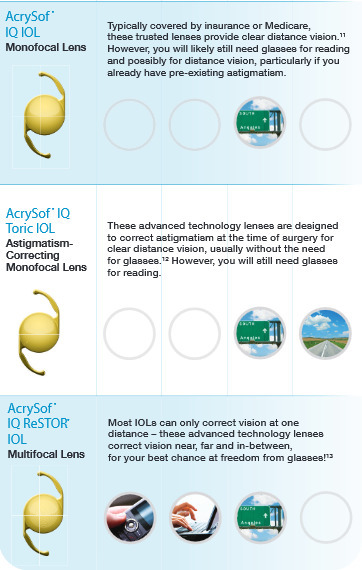 Until recently, IOLs were only available to correct distance vision. 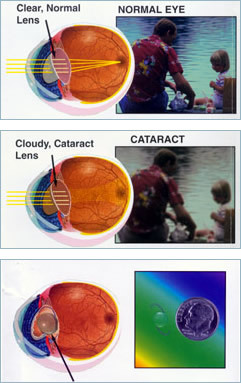 These monofocal lenses helped improve distance vision after cataract surgery, but patients still needed glasses or contact lenses for near vision activities like reading and playing cards. Now, advancements in technology have produced multifocal IOLs that allow patients to see clearly at all distances — near, far and many distances in between. Multifocal IOLs such as TECNIS® and ReSTOR® preserve distance vision and correct presbyopia so cataract surgery patients — and patients seeking treatment for presbyopia alone — can enjoy clear sight without relying on glasses. The procedure to replace a patient’s natural lens with a multifocal IOL is the same as that used in cataract surgery. 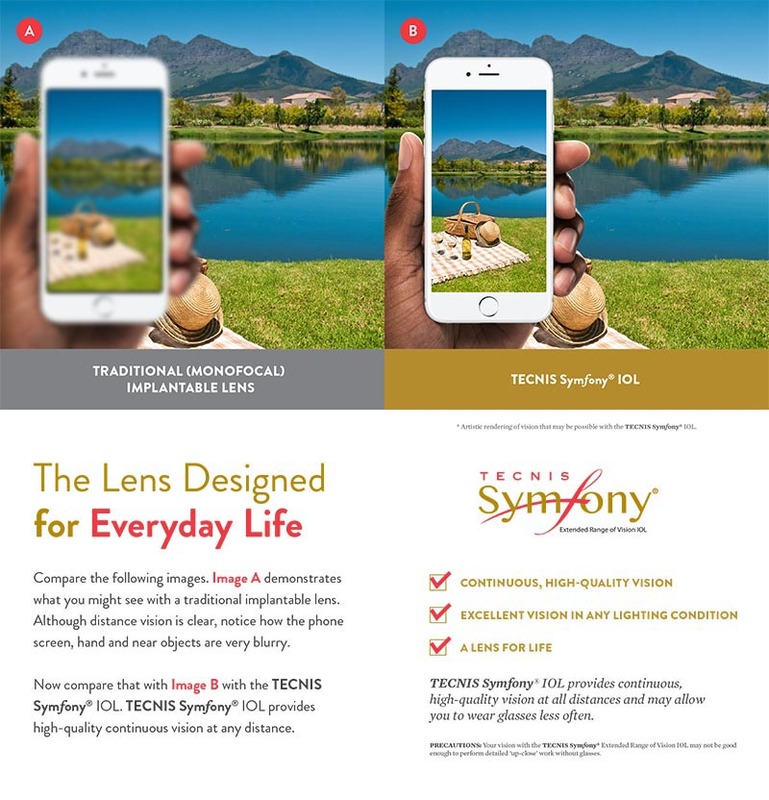 Learn more about how the TECNIS® Multifocal IOL can provide you with a full range of vision.